World Monuments Fund has awarded its 2010 World Monuments Fund/Knoll Modernism Prize to Bierman Henket Architecten and Wessel de Jonge Architecten for their exemplary restoration of the Zonnestraal Sanatorium (designed 1926-28; completed 1931), a little-known but iconic modern structure in Hilversum, the Netherlands. The biennial award will be presented to the Netherlands-based firms at The Museum of Modern Art, New York (MoMA), on November 18, 2010, by Bonny Burnham, president of WMF; Barry Bergdoll, MoMA's Philip Johnson Chief Curator of Architecture & Design and chairman of the Prize jury; and Andrew Cogan, CEO, Knoll, Inc. The presentation will be followed by a free public lecture by Messrs. Henket and de Jonge, who will accept the award on behalf of their firms. The World Monuments Fund/Knoll Modernism Prize is the only prize to acknowledge the specific and growing threats facing significant modern buildings, and to recognize the architects and designers who help ensure their rejuvenation and long-term survival through new design solutions. Mr. Bergdoll states: "The restoration of Zonnestraal met and exceeded the criteria for this prize. Zonnestraal is a Modern-Movement gem of concrete and glass, revelatory not only in its own time, but also each time that architects and historians have rediscovered it after years of neglect. 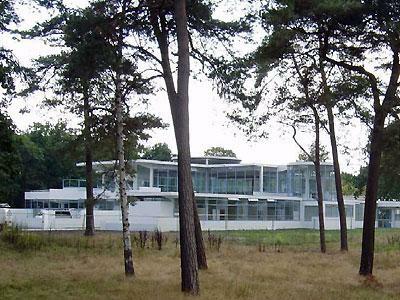 Now that Hubert-Jan Henket's and Wessel de Jonge's stabilization work on the restoration is complete, it reconfirms Zonnestraal's standing as one of the most experimental designs in the fervently creative decades of modernism between the two world wars. It is at once a beacon of Dutch rationalism and a major work of modern architecture internationally, one that can now be experienced in a way that resonates with its architect's intentions." In determining the winner of the 2010 World Monuments Fund/Knoll Modernism Prize, the jury reviewed more than twenty nominations from fourteen countries, including Argentina, Austria, Bolivia, Brazil, France, Germany, Israel, The Netherlands, New Zealand, Poland, Russia, Switzerland, the United Kingdom, and the United States. In addition to Mr. Bergdoll, the jury included Kenneth Frampton, Ware Professor of Architecture at Columbia University; Jean-Louis Cohen, Sheldon H. Solow Professor in the History of Architecture at New York University; Dietrich Neumann, Professor of the History of Art and Architecture at Brown University; Theo Prudon, President of DOCOMOMO/U.S. and Adjunct Associate Professor of Historic Preservation at Columbia University; and Karen Stein, design consultant, writer, and faculty member in the design criticism program at the School of Visual Arts.